HOWARD Kenward lovingly restored his 1919 D-Type Vauxhall over 15 years but never had the chance to drive the ol' girl or hear her run. But he did get a ride on her at his funeral. The Vauxhall is now owned by the Kenward family brothers Geoff, Mike and Chris who completed the vehicle's restoration in the years following their father's death. "This is a concourse-winning vehicle that is period-correct in every aspect,” Michael said. 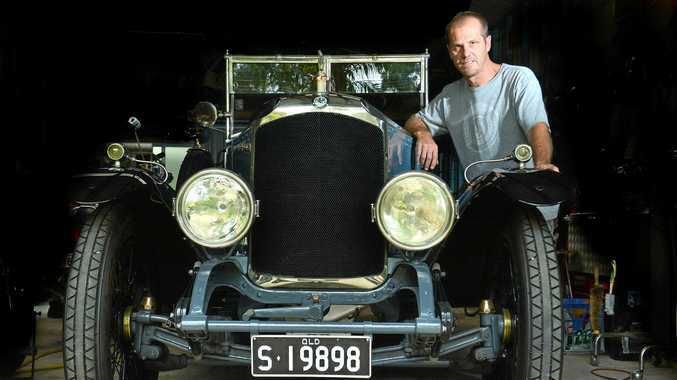 "The Kington open tourer body was built by Howard Kenward, skinned in aluminium and painted by Bodycraft in Caloundra, trimmed in leather by Lance Todd to original detail. "In production from 1912 to 1922, 4000 were built but only 29 restored and unrestored vehicles survive today in the world. 1 Are you a vintage/veteran or latest model lover? Veteran and vintage. Definitely older vehicles, cars or bikes. 2 What was your first car or motorbike? My car was a 1970 Ford Capri V6 GT. My bike was a 1982 Yamaha YZ 490J. 3 How much did it cost? 4 What is your fondest memory of a car? A 1912 Crossley from Brisbane to Canberra. 5 What is your current vehicle? 6 What do you love about it? 7 How long have you had the car and where was it sourced? In the family since 1974. It came from Muckadilla, Queensland, which is west of Roma. 8 Tell us about what's under the metal and are there any modifications? A 4.2-litre, four-cylinder fixed-head side valve that is period-correct. 9 What makes your car so special? Memories and all the time that's been spent on the restoration. 10 How often do you drive your car? 11 Mostly pleasure and personal use or business? 12 Does it have a name? 13 Do you work on your own car or get it maintained at a garage/by the manufacturer/specialists? All in-house restoration except for panel, paint and trim: 17 years in the making. 14 What will your next car/bike be? I just bought an original 1946 Ariel motorcycle. I could not help myself. Many more to come. 15 If you could buy any vehicle in the world, what would it be? An original Ford GT 40 race-prepared. DETAILS Restored by Howard Kenward over a 15-year period. Unfortunately he did not drive her or hear her run but he did get a ride on her at his funeral. The restoration was completed by Howard's sons Geoff, Mike and Chris in the following years. This is a concourse winning vehicle that is period-correct in every aspect. The Kington open tourer body was built by Howard Kenward, skinned in aluminium and painted by Bodycraft at Caloundra, trimmed in leather by Lance Todd to original detail. Production was from 1912-1922, 4000 were built but only 29 restored and unrestored vehicles survive in the world. King George V travelled to the Western Front in World War I in a D Type Vauxhall staff car.